Today we have a small puzzle game from a recent newcomer to Nintendo systems named 10tons. They’ve already brought quite a few games so far to the Switch, and today we’re looking at the newest one named Sparkle Unleashed. What is it and how is it? Read on and find out! 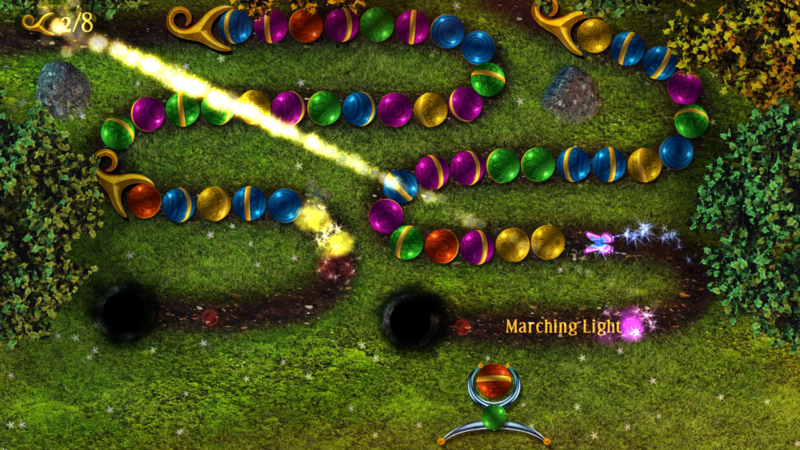 Sparkle Unleashed is a marble shooting game, and is compared heavily to Luxor by Mumbo Jumbo. You may remember that I referenced Luxor in my review of Party Planet which contained a marble shooter game called River Defense and I compared it to Luxor. Well it turns out Luxor isn’t the only marble shooter, since there are games like PopCap’s Zuma series, and River Defense seems more similar to that than to Luxor. 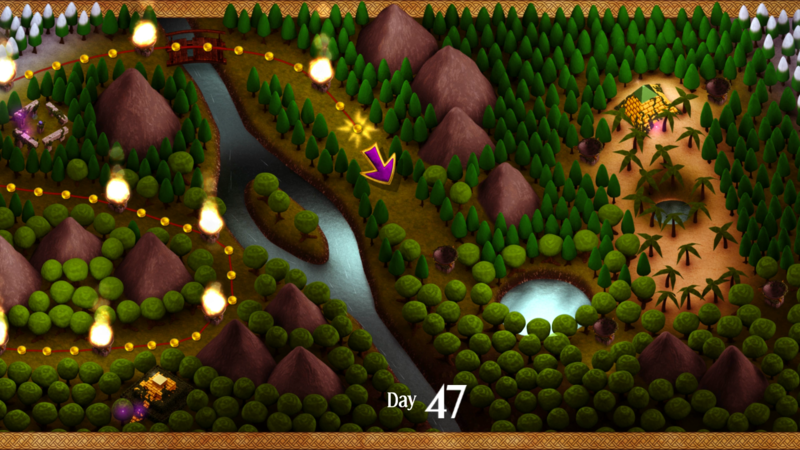 See, Zuma and River Defense features a shooter that’s controlled by turning it around in 360 degrees. Luxor and Sparkle Unleashed instead have the shooter on the bottom and it moves left to right, like in the classic Block Breaker game. The concepts are similar though; match three marbles of the same color to clear them. 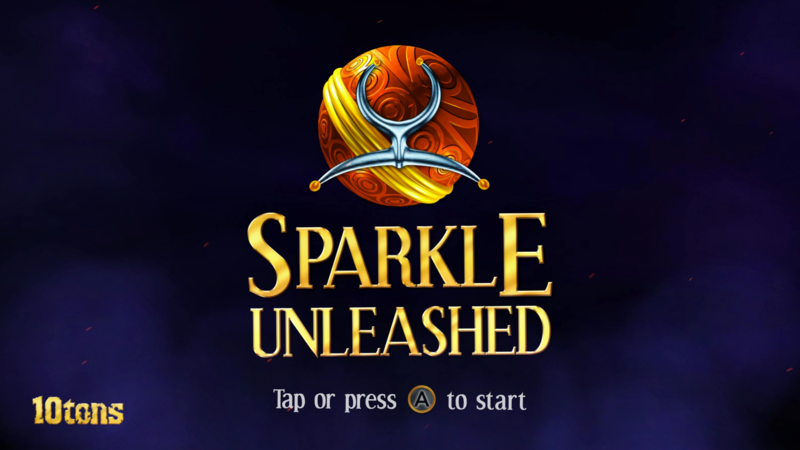 Sparkle Unleashed features a mild story mode which features a voiced narrator just simply telling you that you’re on a journey of sorts, nothing big. The game progresses in a level-by-level structure. 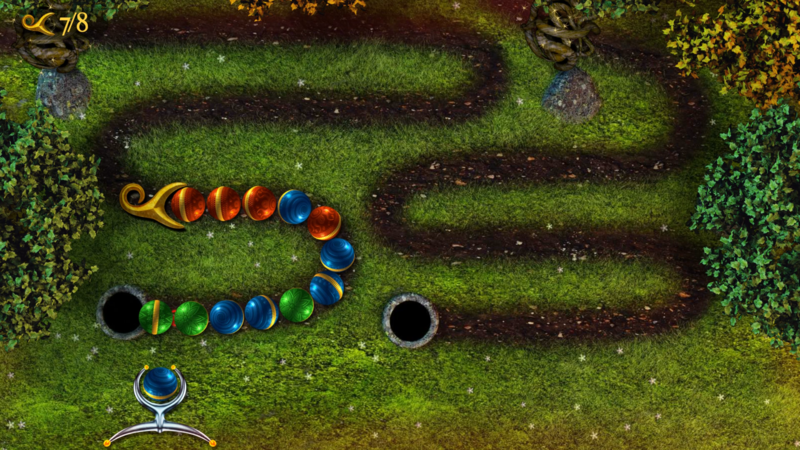 Each level has the marbles rolling in a predetermined line towards a hole, and your job is to clear them all before enough get in the hole. Your shooter holds two balls, and you can flip between them between shots by pressing Y. If you clear enough in a row with one shot, you earn a power-up. Examples include two fireballs for clearing any marble, butterflies to eat a bunch of marbles in a line, or to slow the line down to give you more time. One thing I should note is the really neat option of a Colorblind Assist mode, which changes the marbles into ones with symbols on them. After a certain amount of levels are beaten, you reach a brazier, which gives you a key to unlock any of the locked power-ups you can earn in a level as explain above. 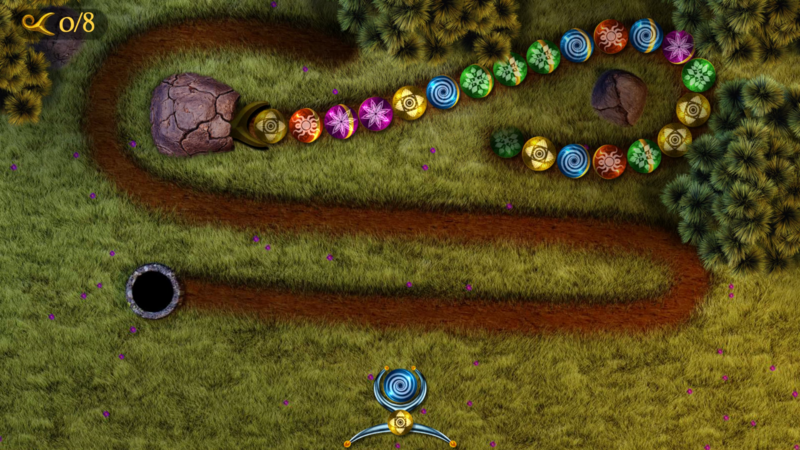 You can also earn achievements by completing certain objectives, such as using 200 power-ups throughout the game, or finishing the level by matching marbles just barely in the hole. Presentation-wise, I’m legit impressed. The visuals are all-prerendered, and the marbles in particular look very nice and animate smoothly. The music has that orchestral fantasy feel and it sounds great! 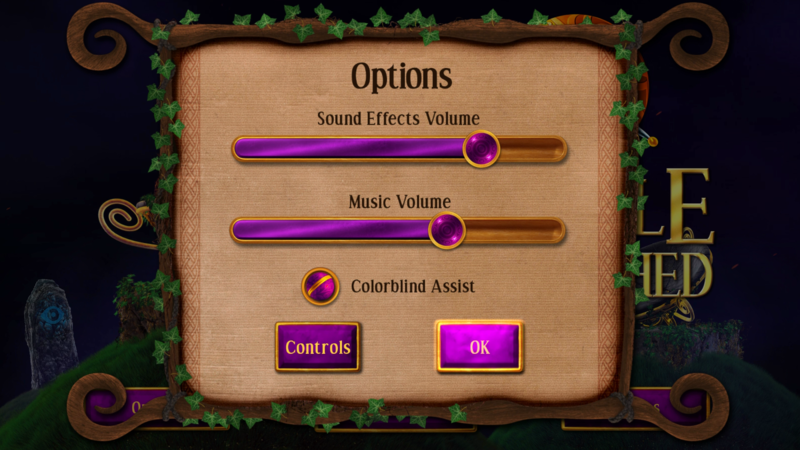 One minor nitpick is that the directions during the tutorials consider both the touch-screen and buttons, so it’s like “tap here or press A”, it gets a tad disorienting and they could’ve just had it be chosen via the options or depending on Switch’s mode, but it’s hardly an issue after a couple of levels. However, I can’t seem to play earlier levels, presumably without playing in portable mode, as the stick won’t let me select the level for whatever reason, you’re basically stuck with the level in front of you. But the levels seem to rotate (they must or they’d have to come up with like a hundred or so names for them), I found that out when I looked at the menu that shows game progress and it says how many times you’ve won a level, with it only listing like 12 names and I’ve done nearly 40 by now! Overall the game really surprised me at how much fun it was. It looks and sound great and again is really fun to play if you’re looking for a good marble shooter. There’s been some minor criticism I’ve heard that it’s a mobile port (evident because of the aforementioned control directions), but who cares? If it’s done right like this, then so be it! It’s also only $10 CDN, so it’s quite a bargain I say! Definitely recommended. + The game’s pretty to the eyes in my opinion. Nice pre-rendering, especially the marbles themselves. + Soundtrack sounds really good with a decent variety of tracks. + It’s not easy, it gets pretty tense with two lines, chained marbles (clearing it will just unlock it, having to be cleared again), so it’s challenging! + Achievements are another thing to work for, so there’s more to do. + Cheap at only $10 CDN! – Confusing control directions if you’re not using a touch screen. – No known way to replay an earlier level if you wanted to, but the levels rotate so it hardly matters. I used to love playing Luxor back in the day, though for the life of me I cannot remember what system I played it on. Anyway, I had a question about the controls. You mentioned the controls were confusing if you didn’t use a touch screen – I assume this means you can play without a touch screen but the controls are less precise? Would love some more information about that as I love these types of casual games to break up long sprints with RPGs and stuff, and for $8USD this is a great price.